The billionaire entrepreneur showed off solar-powered roof tiles that eliminate the need for traditional panels and a longer-lasting home battery. Tesla Motors Inc. Chief Executive Elon Musk on Friday unveiled new energy products aimed at illustrating the benefits of combining his electric car and battery maker with solar installer SolarCity Corp. The billionaire entrepreneur showed off solar-powered roof tiles that eliminate the need for traditional panels and a longer-lasting home battery, which Tesla calls the Powerwall, aimed at realizing his vision of selling a fossil fuel free lifestyle to consumers. "This is sort of the integrated future. An electric car, a Powerwall and a solar roof. The key is it needs to be beautiful, affordable and seamlessly integrated," Musk said while showcasing the products on homes that once served as the set of the television show Desperate Housewives. Musk is the biggest shareholder in both Tesla and SolarCity, which is run by two of his first cousins. Analysts have been dubious of the deal's proposed synergies, with some suggesting the merger is a way for Tesla to rescue money-losing SolarCity. A vote on the acquisition is scheduled for Nov. 17. The rollout of the product, expected as soon as next summer, would be "unwieldy" if the two companies are not combined, Musk told reporters. Tesla's electric car, Powerwall and solar roof are shown by Tesla Motors Inc Chief Executive Elon Musk, unveiling new energy products aimed at illustrating the benefits of combining his electric car and battery maker with solar installer SolarCity Corp.
Having two separate companies "slows things down, makes them more expensive. It's worse for shareholders," he said. Musk refused to answer a reporter's question about how Tesla's balance sheet would accommodate the acquisition of SolarCity. By incorporating solar modules into rooftops, Tesla is hoping to succeed with a solar technology that to date has had little success. Just this year, Dow Chemical said it would stop selling a solar shingle it launched five years ago. Tesla's glass solar roof tiles would look far better than any similar product, Musk said. They can be manufactured in a range of styles, which were demonstrated on the rooftops on the set. Tesla gave little detail on cost, except to say that the cost of the roof would be less than a conventional roof plus solar. 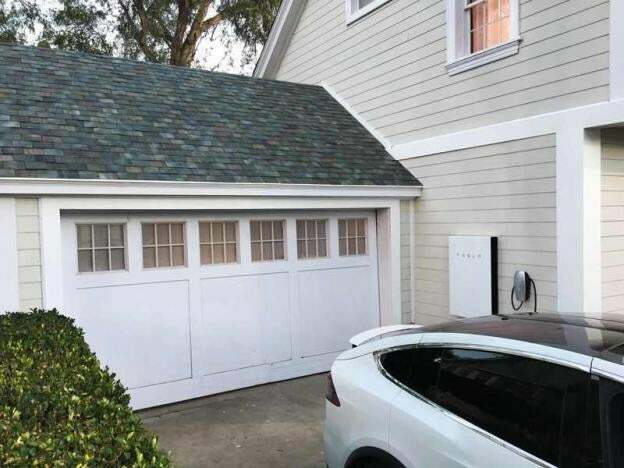 The product will appeal to home builders and people looking to replace their roofs, Musk said, adding that the shingles would be more durable and have better insulation qualities than conventional roofs. SolarCity co-founder Peter Rive, Musk's cousin, said the solar roofs could easily have a five percent share of the new roof market within a year or two. The new generation of home and industrial batteries will be available this year.